This is the 100th blog post from Trump Excel. I have loved every bit of this journey, and I hope to continue to contribute and share all that I learn about Excel Spreadsheets. If you wonder what was my first post, here it is – Trump Excel’s First Post. Before you jump away and download it, here is some background to this template. Have you heard of 7 Habits of Highly Effective People? It is a book by Stephen R Covey. If you haven’t read it, you should definitely go and get a copy today. The idea is to focus on 1st category followed by 2nd, 3rd and 4th. We all create To Do Lists, but if we have this matrix right in front of us, our productivity could take a huge leap. If this looks like a lot of work, don’t worry. Here is the Excel Template that will do it for you. All you need to do is create a simple To Do List (the same way you create every morning) and just mention if it is important and/or urgent. You can Add Task by using the button on the tab TASK MATRIX. It gives a pop-up form where you can fill the details. Alternatively, you can also add a task by typing it directly in the To Do List Tab, and assign the Importance and Urgency level. I hope this Excel Template help you become more productive and save time. I would love to hear your feedback and any improvements that can be made to this template. Also, if you find this useful, do share it with your colleagues and friends and help them become more productive. UPDATE: If you are looking to add more tasks, here is the updated template that will let you add 50 tasks per category and a total of up to 200 tasks. Click here to download. Download To Do List Templates in Excel. Calendar Integrated with a To-do List. 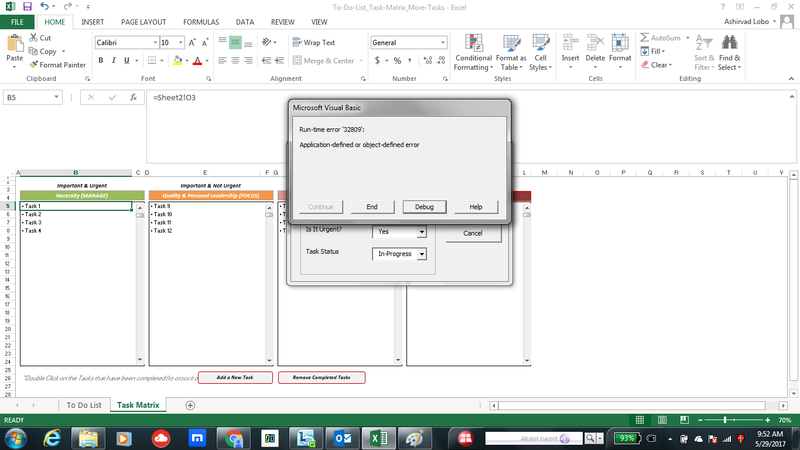 Excel Functions Explained – With Examples and Video. Hi yes that a great ideas you created ! I am super love you creatons. Kindly help me to provide one more things that last year’s leave balance ?author I know where should I add in ? May I know where should I add in for last year’s leave balance? This was such a useful guide and i enjoyed using it . But one doubt, i added one more column in the to do list page but while performing the “remove completed task” action only cells up to “Status” is getting deleted and the new column content remains the same. How to resolve this issue? I’m unable to download the “Task Prioritization Matrix (To Do List) – Excel Template”, Would you kind be able to email me this? This is exactly what I’ve been looking for get started on my internship project. I would greatly appreciate if you could either fix the link or email me the spreadsheet. Thanks in advance! I was unable to download your TASK MATRIX Excel Template. Is it no longer available? The excel link for the eisenhower matrix does not seem to work? pretty cool spreadsheet, thanks for making it available. How do I expand the view to show more than 24 rows? Is there a way to expand to see all 50 tasks in a category? I have downloaded it but it’s not working as like what you shown in the video. Could you please help out this issue ? Thanks so much for sharing this. Much appreciated. Thank you so much to share this great template. > When I double-click on the matrix, no cross but in the table, task is green and status “completed”. Very good start. Thank You. This site is amazing! What I would like to do is make sure I am not neglecting things that are important to my values. I’m wondering if I can add to what you’ve built so that I just write the to-do item and answer a few more questions. Ideally, the weightings of those questions will then categorize each item into one of the four quadrants for me. In other words, it does the same thing as what you built, but in addition assigns the quadrant of the task for me. The way I envision it, in order to make sure I am not neglecting certain values like family time vs time spent trying to make more money, it would assign a diminishing marginal utility as I did more of an item that only improved one part of my life while neglecting others. So, if say I had spent the last month working very long weeks, but had spent very little time with people close to me, doing specific things with them would jump to the top of the priority list. If it could also determine how much time and resources I should put into any one thing in terms of time, money, etc that would be extremely helpful. I don’t think it would be that hard, I am just not sure how to do it myself, especially the marginal utility part. Hi Sumit, I have found this template very useful!! However, there seems to be a strange bug. 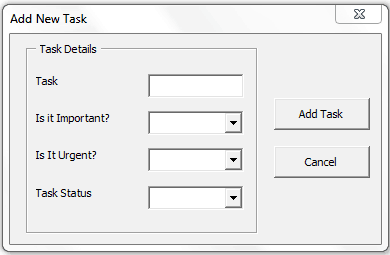 If I add a task that is neither important nor urgent (ie. it ends up in WASTE), if I scroll my list of tasks in FOCUS (Important, Not Urgent) using the scroll bar, it simultaneously scrolls the tasks in WASTE? I don’t know much about VB so I couldn’t fix this. However I modified the data in the first tab so that it includes a column called Rank, which allows me to assign an order to my tasks, thus I can sort that table and my items will appear in the second tab in the order I want to complete them. It would be great if this was automatically managed in the VB side of things so I don’t have to manually sort the data table, but either way it’s doing the job. Very nice and exactly what I was looking for! This works smoothly and is very helpful. Hi great tool and there is something i think would make this awesome tool more awesome. That would be the ability to have Champion (person assigned the task) and Department (i.e. Personal, business, etc). If this was entered at the task list stage when you see everything populate on the task matrix you could then show all or select just those people who have been assigned. You could also select just the areas of your life or what business. The benefit of this is you can have one master task list that then you can slice and dice on the matrix and give a particular person task you have assigned them. I’m trying to use this and it says “The cell or chart you’re trying to change is on a protected sheet. To make a change, unprotect the sheet.”. Using excel 2016. This is an excellent work. 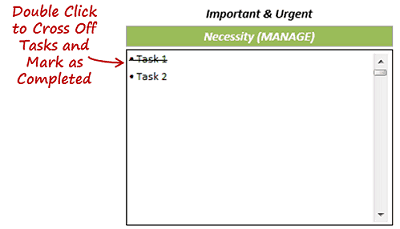 I badly wanted such simple and easy to execute Urgent- Important task matrix. 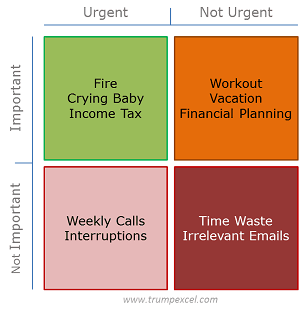 Is there anything similar for Urgency – Impact matrix? Thanks,, Id been following you since just this month it seems i am learning a lot from your tutorial. Keep up the good work bro..:) thumbs up..
Hi I love the template. is it possible to make an archive on the completed task? for example if you already click the complete task it will go to another sheet. Hey Reymark.. That’s a good suggestion. I will try and update the template with it. Are there any Google Sheets versions of this out there? 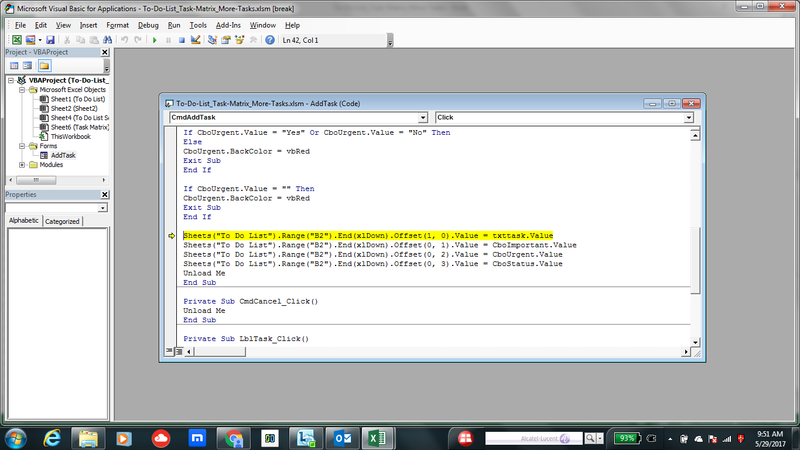 Hey Adnan, Since it uses VBA in the backend, it works only with Excel. I've also tried saving the file as an Excel 97 .xls file, but same result. I am running Excel 2013 (MS Office Pro Plus 2013 v15.0.4569.1506) on in Windows 10. I would really like to give this template a try. Any insight is much appreciated. This is EXACTLY what I was looking for. So easy to use! This is EXACTLY what I was looking for! I figured out how to add more tasks, but how can I display more than 10 tasks in each category on the Matrix tab? I want to see my complete list. Hi Sumit Bansal. I am Brazilian. Thank you for this Excel template. I donwload this yesterday and it have been very usefull!! Hi, I downloaded but can not save after I edit the file. What could be the problem? Sumit, thank you for the tutorial and the templates. Thank you for sharing your hard work. 1. Drag and Drop between Quadrants from the “Task Matrix”, if possible. 2. Hierarchal sub-tasks so that a major-task is broken into sub-tasks. Maybe automated indenting under bulleted major-task? Sub-indentation with a hyphen? 3. Font of done items to be in Grey font with a double strike-trough applied. Thanks for commenting Nigel.. Glad you like the template..To move certain tasks to another box, simply change the Importance and Urgency value of that task in the ‘To Do List’ worksheet. Whenever you add a task, it automatically gets recorded in the to-do-list worksheet. “You can have anything in life you want if you’ll just help enough other people get what they want.” Zig Ziglar You my friend are doing just that and I hope that God blesses you for that. Thank you for sharing. As usual great work. like your many other videos, it would be nice if you could give us a video on how to create this template. How can I remove the video link from the To do list worksheet? This function doesn’t work with EXCEL 2007. Does it need to be updated? I can’t double click to cross it off, and I cannot use the Remove completed Tasks button. All in all, its a great product. Hi Sumit, thank you for the great tool. Do you plan to also add a deadline to each task ? This is great – is it possible to get it working in Google Spreadsheets? Hello Sumit… Great work!!!! But, I am unbale to strike off the completed activities. Well My office laptop has MS Office 2007. Wherein I did click on Enable Content, still unable to strike off the completed activities. Hello this is a very good template. I was wondering it would be even better if we can see the status for each task in the task matrix tab. Is there a way to include that ? I wanted to make the quadrant matrix look like the Covey diagram – 2×2. So I moved the 2 right areas under the 2 left ones in the Task Matrix tab. Once I did that, double-clicking to complete the task no longer works. Using the drop-down in the To-Do tab still works. I can’t see how the double-clicking is set up. Is there a way to set it up with the new layout for the quadrants? Hi Sumit, great and helpful file!! I moved the boxes like Mike did and got the same result, how can that be solved? Summit…i would like to change the title of the column “Not important & Urgent.” How would i do that? Nice job, I like it. 1. how to add more than 50 Task? 2. is it possible to show how much job is doen by persentage? 3. how about assign the job? just name. Thanks Sumit. Its a great work. Is it possible to include the time? Hi Mohamed.. Glad you liked it. Good Suggestion. It can be done. I will try and update this soon. This is great. You might consider making a video or instructions on how you made this Template. It would be an instructive Excel learning tool to know how you constructed the whole thing. Thanks Lecram.. Sure thing. Will soon make a video tutorial on how to create this from scratch. Has this video been made to show how to make from scratch? Thanks Raymond. Glad you liked it! can you check and rectify . Dear Sir, i want to implement this sheet for my work. but i am not able to delete the completed work by double clicking. some debugging issue. Can you help me.